The Public Maps Gallery template is designed for ArcGIS Online users who want to showcase their maps, layers, and mobile apps in a dynamic gallery. 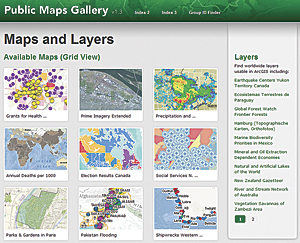 A new way to access ArcGIS Online web maps is to use the Public Maps Gallery template. 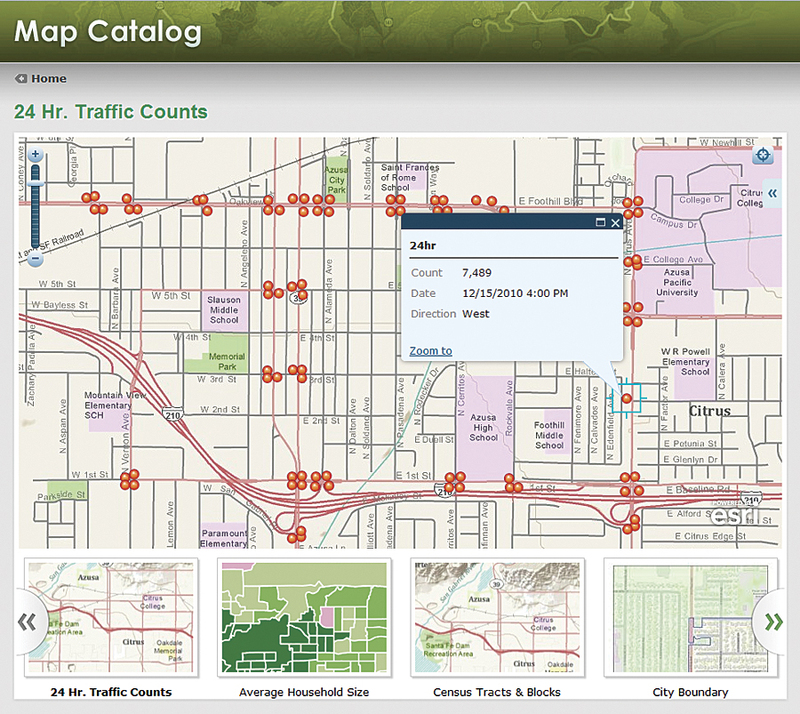 The template allows users to quickly set up a map gallery web page on their own site while managing the content for it through ArcGIS Online services. The system is lightweight, easy to use, and free. Individuals and organizations can use the gallery template to provide their customers with fast access to commonly needed mapping information. 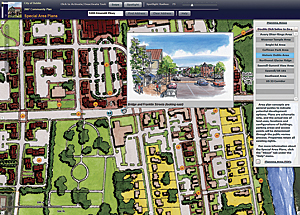 Template users take advantage of the free account tier of ArcGIS Online, which is limited to two gigabytes, to store maps, map layers, and mobile apps. Basemaps, such as Esri's World Topographic Map, Ocean Basemap, and the new Light Gray Canvas Map, are already hosted on ArcGIS Online, so the storage footprint of a web map is small—usually just a few kilobytes. 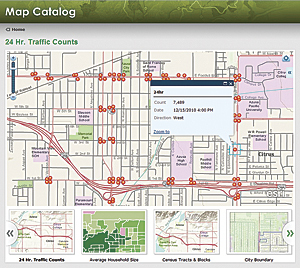 The City of Azusa, California, Map Catalog is used to access city demographics, earthquake faults, local wildland fire history, and 24-hour traffic counts. The gallery is dynamically linked to ArcGIS Online through a publicly shared group and the items it contains. The owner of the group can add and share items with or unshare and delete items from the group, and the changes are automatically synced with the gallery. Nearly all the elements of the gallery are customizable with simple edits to just a few files. Users with a basic understanding of how web pages are put together will have no trouble customizing the template to fit the look and feel of their website. More experienced web developers will be able to do much more, including embedding the gallery in a web page. The Public Maps Template was first showcased in the Extend the Reach of Your GIS seminar (the latest component of the Success with GIS Series of seminars from Esri). The seminar, which was held in 67 US cities last fall, taught attendees how to leverage current capabilities in ArcGIS to efficiently share geographic knowledge within their organizations and with the public. 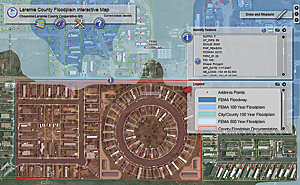 Seminar materials, including a video about configuring the template, can be found at esri.com/seminarresources. This urban tree canopy map with a local park system overlay is available through the City of Rockville, Maryland, Maps Gallery. 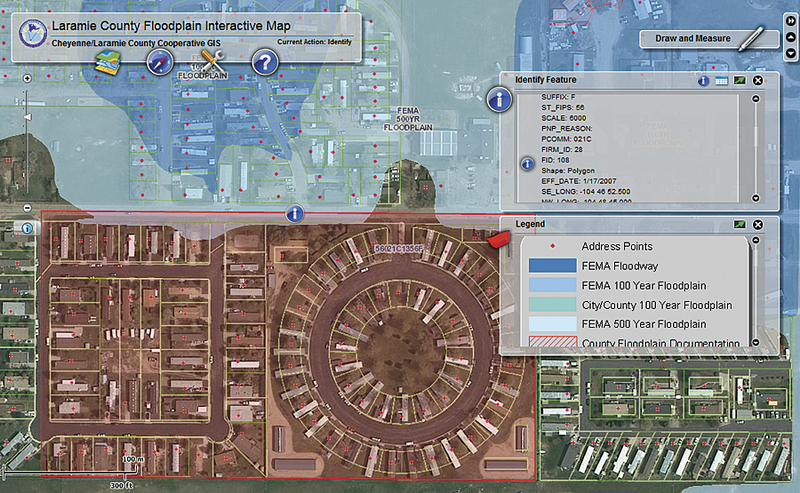 The Laramie County, Wyoming, Floodplain Interactive Map is available through the Cheyenne and Laramie County GIS public maps gallery. 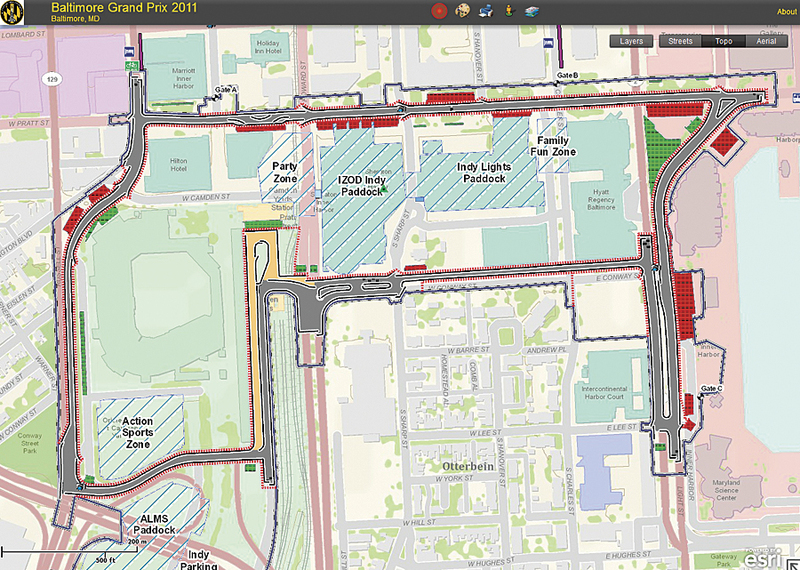 The template is available at no cost through ArcGIS Online. 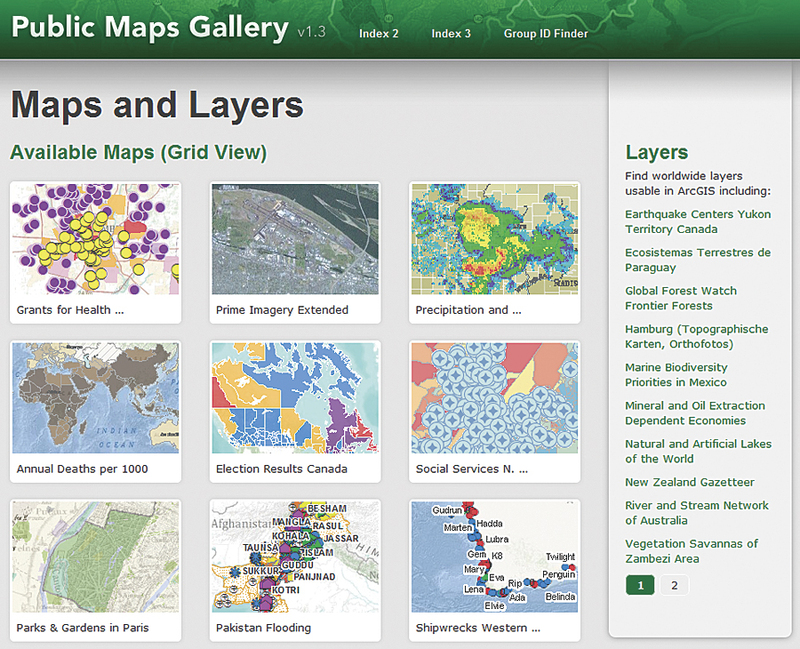 Go to arcgis.com and search apps for "Public Maps Gallery." Select the 1.3.1 Public Maps Gallery template item to learn more about it, as well as download it. There's a tutorial for getting started with the gallery template in the Fall 2011 issue of ArcUser titled "Use ArcGIS Online to Manage Your Own Custom Map Gallery." For more information, visit arcgis.com. 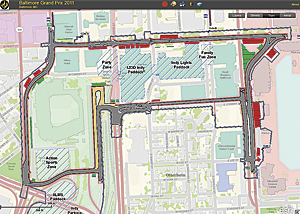 The City of Baltimore, Maryland, Maps Gallery includes the interactive Baltimore Grand Prix 2011 map to help citizens visualize the layout of the race course. 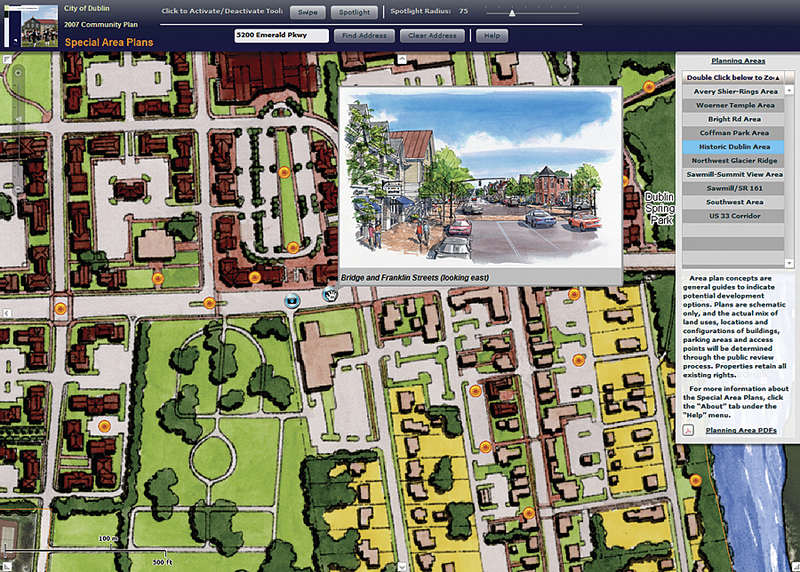 The Special Area Plans map is part of the Spatial Information Collection for the City of Dublin, Ohio. It includes graphic concepts and design recommendations developed for nine geographic areas as part of the city's land-use plan.